One of the things which has fascinated me to no end from the time I was a little kid running around playgrounds is the concept of time and I believe that the ideas surrounding the flow of time, time travel, as well as how time fundamentally works and exists have always been great wonders to scientists and layman alike. Scientists, philosophers and great thinkers throughout the centuries have all tried to understand the nature of time and conceptualize it, and to varying degrees of success have many come up with different notions of time and how it works. A quote from the foremost scientist Einstein reads, “the distinction between past, present, and future is only an illusion, however persistent”. To expand on this, it is interpreted that time – past, present and future all exists on the same plane and are made all at the same time. This would mean, mind boggling as it sounds, that the whole spectrum of time has already been made and that the future has already been forged before we humanly perceive it to materialize as a point further in time. This would lead on to the idea that everything in life and in time has already been pre-determined; in simpler words, everything that happens or is to happen is pre-destined and fated to be. A portion of the science community has followed Einstein’s lead and carried out experiments to further the theory and there appears to be significant progress in this area. (If you would pardon my shallow knowledge in science, I am not able to detailedly share with you the physics behind it but I am sure reading through science articles and journals on this would help in understanding how far exactly our respected scientists have worked in this interesting area). Moving on from the science and assuming that the theory of the past, present and future has already been made is true, the question that begs to follow is: wherein then does free choice lie? If we were to take the theory to now be true, there is no such thing as free choice and all that is meant to and supposed to happen will take its rightful place in time as though orchestrated. Well here’s where the debate lies and here is where choices are made. Barring the outcome of whether the theory will remain status quo or someday be proven to be true, would you like to believe that everything is predestined and we all have limited, or rather no role to play in how life pends out? Would you choose to believe you are the master and maker of your own destiny, or would you decide to acknowledge and accept the idea that everything has already been scripted and is waiting to be rolled out for you? And so I believe that regardless of how or what science proves in this matter, the choice depends ultimately on what you believe in and how you want life to be for you. A choice between master and servant. Would it be a film that is all cheesy and lacking in emotional depth? Then winning her heart perhaps is something many simply would not even dare to try. 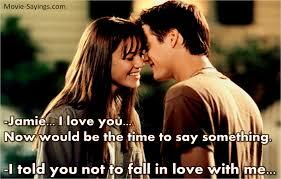 I just finished watching A Walk To Remember and I have to say it is really good stuff. It is so sweet, so romantic that I was going aww about half the time throughout the movie. The entire courtship was so romantic, so natural and just so heartwarming. The Dancing In The Moonlight scene was just so good (in bringing out the love and romance) that I don’t think the song has ever sounded better in any scene or setting; it was so suited for the atmosphere of the scene I thought that wow, it’s almost perfection. [Oh and how can I forgot this] I like the scene where Landon defended Jamie and punched his mate for the fool he had made of Jamie with the photoshopped image. It was one of those moments where you can feel the genuine love and care that the Landon has for Jamie and it was nice to see him holding her close and tight and reassuring her everything is alright. The garage scene where Landon asks Jamie whether she was scared and she replied ‘to death’ and how she was so scared of not being able to be with him.. that is just so sweet and it really tugs at your heart. The relationship seemed to be going all smooth and happy and I thought hey, this cheesy love affair is fun and cool stuff, until the plot twist revealed Jamie is terminally ill. That was such a heartbreaking moment and you can just feel spirits sink. I thought the whole idea of stargazing, of dancing under the moonlight, of doing special little things to be so apt for the movie and the frequent mention of God fits in well too with the whole message of love, death and living life to the fullest. The contrast in the 2 father roles was good too, and it does show that however appearances may seem, fathers will always love their children. The music worked well to complement the scene as well and did help in making things all the more romantic, and all the more emotional whenever necessary. Absolutely no regrets staying up all night to watch the movie and dedicating a blogpost in the breaking of dawn to talk all about it. It is little wonder that she cries every time she watches the movie simply because there is so much of feels and love encapsulated in a short hour and a half movie. Thanks to the girl who lent me the movie, but if she sets the standard of romance and love to be this high.. well, she’ll need a boy who’s really awesome haha. Good night and good morning folks. A friend just linked me to his wordpress blog and the one thing I had to be reminded of was definitely R&R and so I have to drop by and have a look around again. It’s the second day of christmas today (Boxing Day) and with all the christmas feels and love, I find that my blog is actually quite christmasy and cheerful (there’s even snow, gosh). The last post that came from me here was more than a year ago and I have to say things are looking quite different now as compared to the time last year; I am still the same person but my general feel towards things is quite different and my prospects seem slightly better than it was a year ago. Christmas puts me in a really joyful and cheery mood and I get lost too many times staring at the beautiful lights that endow every christmas tree and places all around the country; they are mesmerizing enough to captivate me and place a smile on my face. As with every other year, I set a new year resolution during the Christmas period and I place it in a subtle corner as a reminder of what I want to achieve in the year ahead. Looking forward into 2014, I can feel a very busy and tiring year in the waiting and I believe faith and love next year will be of paramount importance and comfort. It would be exciting I suppose, to race against time again (and strive to be the faster of the two) and push limits and boundaries. That’s it folks, it looks fairly hard to follow so I do wish myself the best of luck in achieving them. More than this, I wish everyone who has come up with a new year’s list the best of wishes in ticking off objective and goals upon completion and achievement. It certainly would make your year much more exciting to have bull eyes to hit and pins to strike down. What do you deem to be really important to you as you enjoy Christmas and look ahead into the new year?